I constructed a scenario based on a fictional 1759 cutting-out action on the coast of France. The type of action and the end result could vary widely depending on the choices made by the players. The British Captain could send in boats under cover of darkness to board the privateer sheltering in the cove, or wait for reinforcements that would enable him to neutralize the defending battery, or wait until dawn and high tide (and, hopefully, a shift in the wind) to charge in and take her by force. The French Privateer could send men from his depleted crew to fetch reinforcements, or to man a signal fire on the headlands to warn him of the approach of the British longboats, or ask for help from the battery commander to defend his ship, or he could slip anchor in the night and make a run for it in spite of being outgunned. 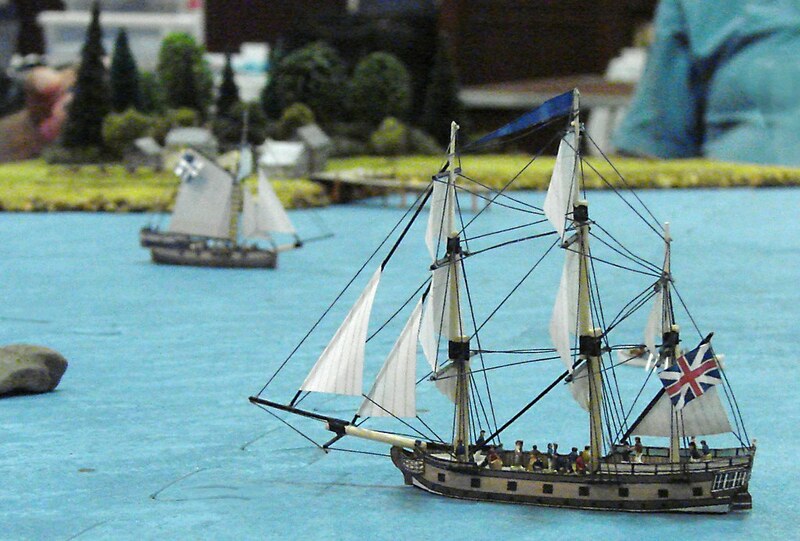 In the end, the French privateer was captured in all three runs of the scenario. I'm very impressed!! The scenery in the background is realistic. The water looks pretty good, too, though I suspect there's a bit less room for creativity there. The ships are great, as well. Are they scratch built, or are they something you can buy? I would have gotten away if it hadn't been for those meddling kids! That was a fun scenario, and a great way to play a cutting out expedition. I played both sides, and I still want to play it a few more times. I have ideas to try. Great photos. Were you using your Away Boarders rules without point to point movement? If so, I'd like to see the variation. No variant . . . the points are there. For the points on this set of sea mats, I chose a light gray that's clear enough when you're bent over the table making a move or a shot, but tends to blend in from a distance. If you look closely, you can still see them. Absolutely superb vessels and terrain, well done! Thanks for sharing the photos. Where did you get the figures to man your ships, boats and artillery? Some of the more recognizable figures (like marines, officers in bicornes and gunners with implements) are Langton's 1:300 scale. The numbers are filled out with 1:300 scale architectural figures, which are dirt cheap. Some don't work well (like men with briefcases or women in skirts) but most are generic enough that a little paint can make them into anything, and the figures meant to be seated on park benches make excellent oarsmen for the boats.